In a super-blue state like Massachusetts, Super Tuesday was the Election Day that mattered. The outcome in November is a foregone conclusion: The Democratic presidential nominee will win the state by a landslide. So Tuesday's primary election was the only chance Bay State voters had to cast a ballot that might have an impact. I cast mine for Bernie Sanders. As a free-market, strong-defense, Reaganite conservative, I have voted Republican much more often than not. But heading into Super Tuesday, every indication was that Massachusetts Republicans, like GOP primary voters in most other states, were poised to give Donald Trump a resounding first-place victory. I don't understand the death wish that has gripped so much of the Republican electorate. It's particularly shocking to see it take hold in a state where Republican primaries tend to be won by candidates like Mitt Romney, John McCain, Charlie Baker, and Bill Weld. But with Republican primary voters this year seemingly hell-bent on jumping off the Trump cliff, I decided that casting my ballot for one of the non-Trumps in the primary would be a futile gesture. So I took a Democratic ballot instead. To be clear: I do not "feel the Bern" and never have. The Vermont socialist's economic ideas are a recipe for stagnation, shortages, and stifling statism; his endless harping on the wicked "billionaire class" fuels a politics of envy that I find pernicious. Still, I didn't hesitate to vote for Sanders over Hillary Clinton. On most subjects, Sanders is guided by principles that are light-years away from my own. But no one doubts that he has strong principles. And no one thinks he would abandon those principles overnight if it were politically convenient to do so. Can the same be said of Clinton? Like many voters, I sense that her only unshakeable principle is the acquisition of power. She is prepared to say, or unsay, just about anything if she believes it will win an election or gain an advantage. Opinion polls repeatedly find that a majority of Americans consider her dishonest. 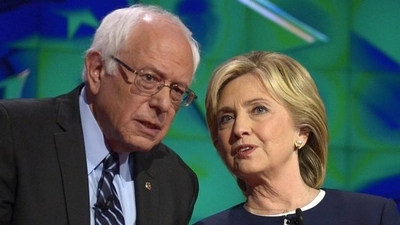 By my lights, both Democrats have a lot of bad ideas, but only Sanders doesn't demonstrate bad character. I don't want Clinton or Sanders to be the next commander-in-chief; neither will get my vote in November. All the same, I want political parties to nominate candidates who have serious principles and some measure of integrity. As between Sanders and Clinton, it's clear which candidate fits that bill. By my lights, both Democrats have a lot of bad ideas, but only Sanders doesn't have a bad character. That was my litmus test. I don't know if it's too late to stop the GOP from anointing a grotesque and mendacious lout like Trump as its presidential nominee. But perhaps Democrats can still be persuaded to choose as their standard-bearer a candidate who believes that there are objectives more important than his own self-aggrandizement. Better a Democratic maverick who says what he means than a ruthless Democratic chameleon whose word can't be trusted.